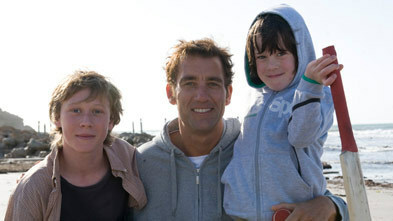 Clive Owen stars as Joe Warr, an Australian sports reporter and father coming to terms with the tragic death of his second wife, and the realities that come with being a suddenly single father to his 6-year-old Artie (Nicholas McAnulty) and his teenage son Harry (George MacKay) who moves from the dreary olde England to Australia to live with his father. While treacly movies like this are a dime a dozen, and while there's certainly nothing new here - with the confused father taking to drink; the grieving grandmother trying to replace her daughter by interfering in the lads lives; the rush of scenes to male bond and the inevitable final act where everyone makes up - The Boys Are Back is saved by Owen's solid acting and director Scott Hicks' fine camera work. It's all mildly entertaining if you can get past the aggravation you feel wanting to slap the kids senseless when they get whiny.